RE: Jerez 2019 - anyone going? Yup I'll be there. See you on Sunday. i'll msg you my contact details. Yep i am indeed, looking forward to it. Just back from Jerez. Met up with ddias and had some great food, some great flamenco, and most importantly great company. Sadly didn't get to meet Henry due to bus issus (lack of) between Jerez and Sanlucar. The weather was perfect which apparently it wasn't last year. Put it in your diaries for next year. I'm now ready for more. Think I'll return Wednesday. Great to meet you Nigel! Fabulous weather both in Jerez and my onward trip to Morocco. ddias you made me look like a gitano! Think I'll replace my hornet with that. Had a great first lesson with Moises(feel quite inspired despite the amount of home work he gave me), but the weather turned rather sad and wet. Hope that didn't follow you further south on your travels and that you had a great time. 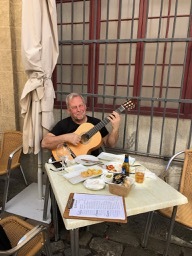 As an aside my new prof recommended an Argentine luthier, living in the centre of Jerez just down the road from him, who will fit the new tuners to my Anders. Sorry didnt make it guys, it was a good 8 days for me, weather was nice, got some lessons in with Jesus Agarado el guardia, Juan Manuel Moneo, Miguel Salado and a Cursillo with Manuel Parilla. Enough material to do me for another year. Plus spent the last three days hanging out, relaxing and enjoying the weather with the girlfriend. The gigs in La Guarida del Angel were the highlights for me, seeing alot of the local artists, Perikin, Juan Villar, El Zambo, Juana la del Pipa etc. La Moneta in the Villamarta, was a great gig, shes a force of nature, very vibrant and a joy to watch. Paco Cortes on guitar was nice to see as well. I'm planning to return next year and maybe later in august for a quick trip. We shall see.